It’s one of those dream match-ups you rarely ever see: a star writer and a star director joining forces to try to bring the best out of both. There are very few star writers, and most of the ones you’ve heard of like Paul Haggis end up directing on their own scripts. Sorkin is a rare breed: he never seems to have cared much for getting behind the camera (the IMDB lists no directing credits), and he’s written very few movies, but nearly all of them are recognizable and/or classics: A Few Good Men, Malice, The American President, and Charlie Wilson’s War are the only movie credits to Sorkin’s name, but he became a celebrity TV creator when his series The West Wing hit big. His notable failures Sports Night and Studio 60 at the Sunset Strip have their followers. Also in on this party is author Ben Mezrich, who wrote another book about college kids becoming wildly successful: Bringing Down the House, a story you might know better as the movie 21. He has obviously got a friend in Kevin Spacey because Spacey produced 21 and he serves as executive producer on The Social Network, which in a way becomes a reunion with his Se7en director David Fincher. This doesn’t seem like a movie Fincher would be drawn to, but then again I guess The Curious Case of Benjamin Button didn’t, either. And thus Fincher has now made two movies in a row departing from the thrillers he’s known for, although The Social Network retains the dank cinematography of his better known movies (here shot by long-time off-and-on again cinematographer Jeff Cronenweth). The Social Network is about the creators of Facebook, the social networking site that everyone is on except me. It focuses on Harvard computer whiz Mark Zuckerberg (Jesse Eisenberg) and suggests a domino effect caused by a breakup with girlfriend Erica Albright (Rooney Mara) that leads to the ultimate creation of the popular site. Getting drunk after his breakup, Zuckerberg writes awful things about his ex on a blog and then starts stripping pictures off of various sororities, creating a site called Facemash that invites the Harvard campus to rank girls’ hotness against each other. The site crashes Harvard’s network and lays a significant amount of heat on Zuckerberg…and gets him noticed by other driven individuals wanting to use his skills. Those individuals are (future Olympic rowers/brothers) Cameron (Armie Hammer) and Tyler Winklevoss (Josh Pence) and their friend Divya Narendra (Max Minghella). They want him to make a site that we all recognize is the basic foundation of Facebook, but for Harvard students only. However, Zuckerberg doesn’t like where they’re going and proceeds to blow them off for six weeks while he makes his own version of the site, with the help of his friend and financial backer Eduardo Saverin (Andrew Garfield). He puts it online for Harvard and it immediately becomes popular right underneath the Winklevosses and Narendra’s noses, until it is discovered and they try to take every action to punish Zuckerberg for stealing their intellectual property, ending up in court when Facebook becomes a billion-dollar generator. While Zuckerberg evades the Winklevosses he tries to amp up the popularity of the site by offering Yale, Columbia, and Stanford his site. At Stanford it is found by Napster internet rock star Sean Parker (Justin Timberlake, in a role perfect for him) and from there Parker greases the money men to take Facebook to the next level and generating revenue. This creates a conflict between Parker and Saverin, who was named CFO early into the Facebook process. The movie tells its story from the perspective of the depositions taking place, which allows the movie to skirt being absolutely 100% factual. As an assistant attorney (played by Rashida Jones) says later, “I know that 85% of the testimony is blown out of proportion, and 15% of it is perjury.” Well, that’s the movie’s position I am certain. It allows the events that take place to take on a more entertaining feel, rather than being a biopic where the movie fights hard to try to get everything we feel defines a real person’s story in the movie. And I’m pretty certain that the characters involved here didn’t snap out dialogue like Sorkin does. And boy, is Sorkin on display here. There are a lot of memorable lines, and we have a band of dedicated actors spouting it out. It’s Jesse Eisenberg’s movie and no one steals it from him. His dialogue rips through the movie, going 100 words a second it seems like. This is a guy who wants to join huge social clubs but has no social skills, seems slightly misanthropic, driven only by creation for the sake of creation, and classically, ironically, because of a girl. 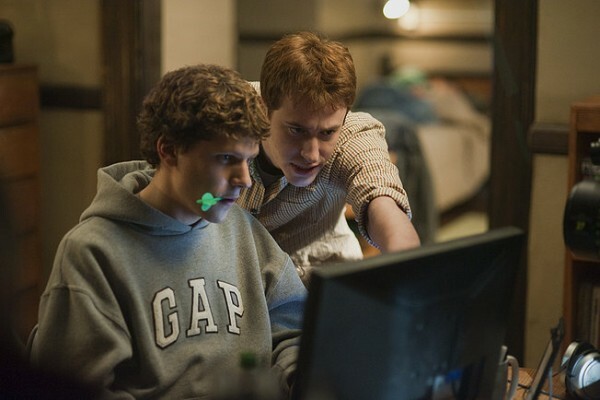 If The Social Network takes off, this might give Eisenberg an Oscar nomination. Finally, we get to David Fincher. Fincher’s style is present here, but I think like any good director he realizes the script is so good he doesn’t need to distract too much and he almost pulls off a perfect movie. Some things probably could have been cut (a rowing race with the Winklevosses), especially since in the next scene a character incessantly natters on about how close the race was. But anything I could really say negative about this movie would be a nitpick, and something that likely in future viewings would not be taken as a negative at all. When you start truly loving a movie, those flaws disappear. I’m not sure the movie is as fantastic as you’ve probably been reading, but I think it’s certainly one of the best of the year. And I say don’t go into the movie with lifted expectations of greatness. One thing we all know is when your expectations are lowered, the movie gets a better chance, and The Social Network deserves that tempering.